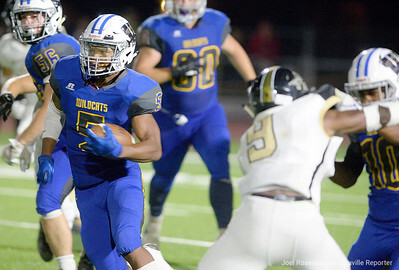 Wood running back, Adonis Dennis breaks through a big hole for a big gain during the fourth quarter of the Wildcats non-league victory over American Canyon High School. 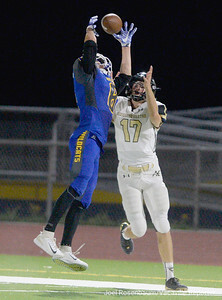 Will C. Wood defensive back, Isaac Pewitt knocks away a pass intended for American Canyon wide receiver, Brandon Seay in the end zone late in the fourth quarter of the Wildcats' 28-22 victory over the Wolves Friday at Wildcat Stadium. 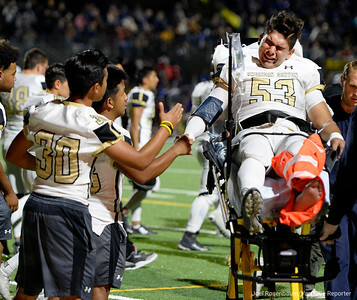 American Canyon’s Jose Lopez shakes hands with his teammate as he is transported to a waiting ambulance by members of the Vacaville Fire Department after he suffered a compound fracture of his leg when he collided with a player from Will C. Wood High School while he attempted to kick an extra point during the first quarter of the Wolves 28-22 loss to the Wildcats Friday at Wildcat Stadium. 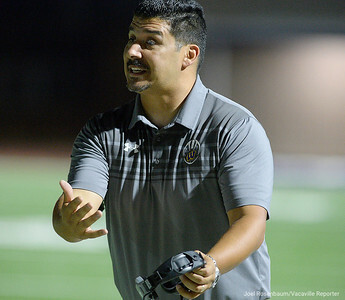 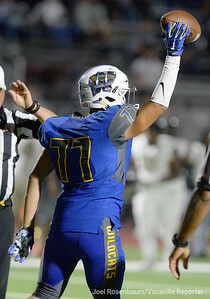 Will C. Wood defensive lineman, Agustin Miranda reacts to the cheers of the crowd as he holds the football high after he recovered a American Canyon High School fumble in the first quarter of the Wildcats 28-22 victory over the Wolves Friday at Wildcat Stadium. 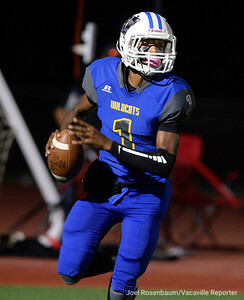 Will C. Wood high quarterback, Jhalen Grayer rolls out as he looks for a open receiver late in the second quarter. 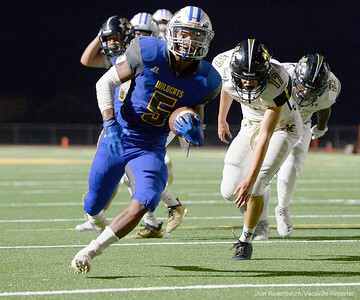 Wood running back, Adonis Dennis sprints away from the American Canyon defense toward the end zone for a touchdown during second quarter. 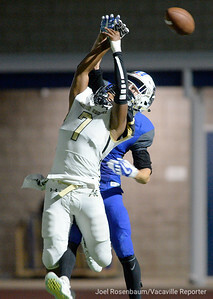 Will C. Wood defensive back, Isaac Pewitt knocks away a pass intended for American Canyon wide receiver, Billy Biondini during the second quarter of the Wildcats 28-22 victory over the Wolves Friday at Wildcat Stadium. Will C. Wood high defenders smother American Canyon running back, Eddie Byrdsong behind the line of scrimmage during the third quarter. 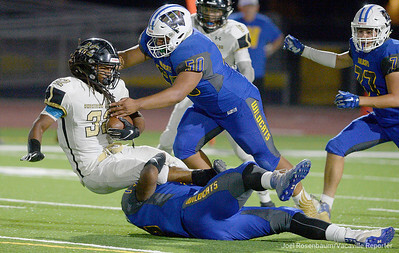 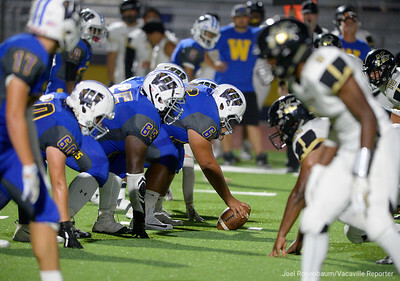 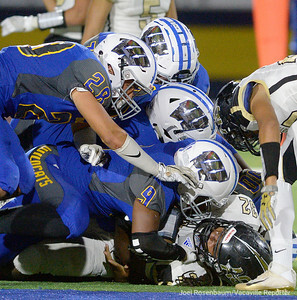 Will C. Wood defensive linemen Kamani Currie (bottom) and Javier Contreras stuff American Canyon running back, Eddie Byrdsong for a loss during the fourth quarter of the Wildcats 28-22 victory over the Wolves Friday at Wood. 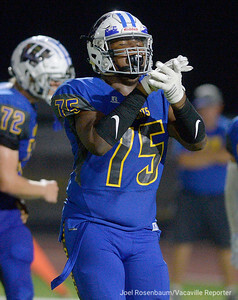 Wood linebacker, Kamani Currie celebrates his big play during the fourth quarter. 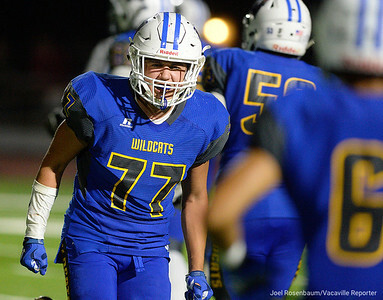 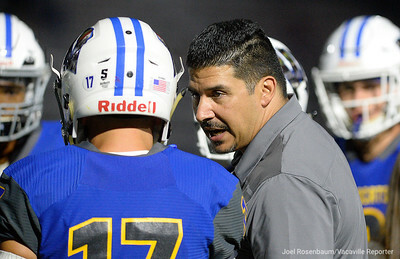 Will C. Wood defensive lineman, Agustin Miranda celebrates with his teammates after the Wildcats stopped American Canyon High's final drive of the game.